Some of you will know that I have been participating in the #365handstitch2017 challenge where people are asked to stitch a minimum of a thread a day for a year. I thought it was time to show you the progress so far. As you can see I’ve already added several pieces of cloth together and am working on melding them together. I made the decision up front to ‘stitch with my eyes closed’, (a process I have been using since I first started this blog). Working this way has meant that I do not visually self-censor. This choice has removed from me the necessity of neatness. I also find the process of leaving the decision about which thread and which stitch to use, until the moment I pick up the work, really freeing. Other people online have asked some very pertinent questions about the direction the work is taking. This has made me think about a number of issues, in particular whether I have a specific end in sight – no; and how much bigger the piece might become. So I have decided that the current size is where I will leave it (at present). 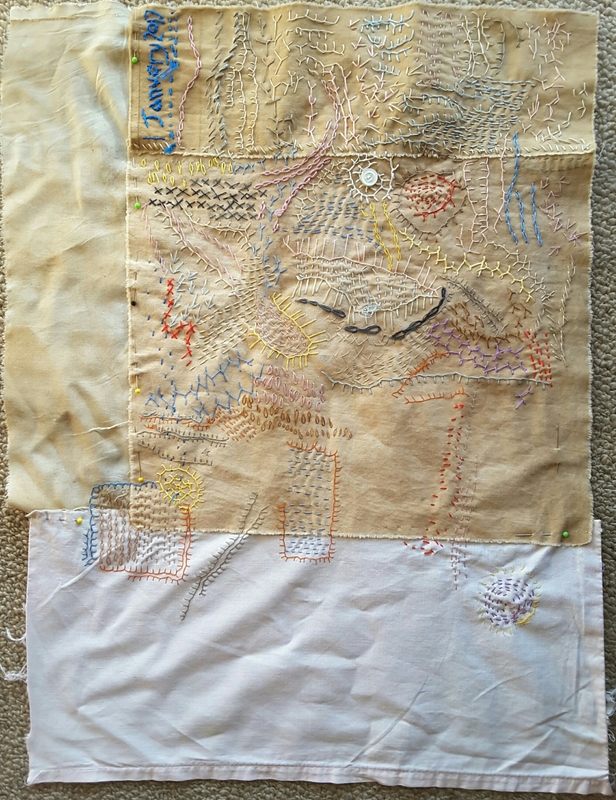 The obvious question of what to do when I run out of space to stitch, was equally quickly answered -work on ‘the back’. 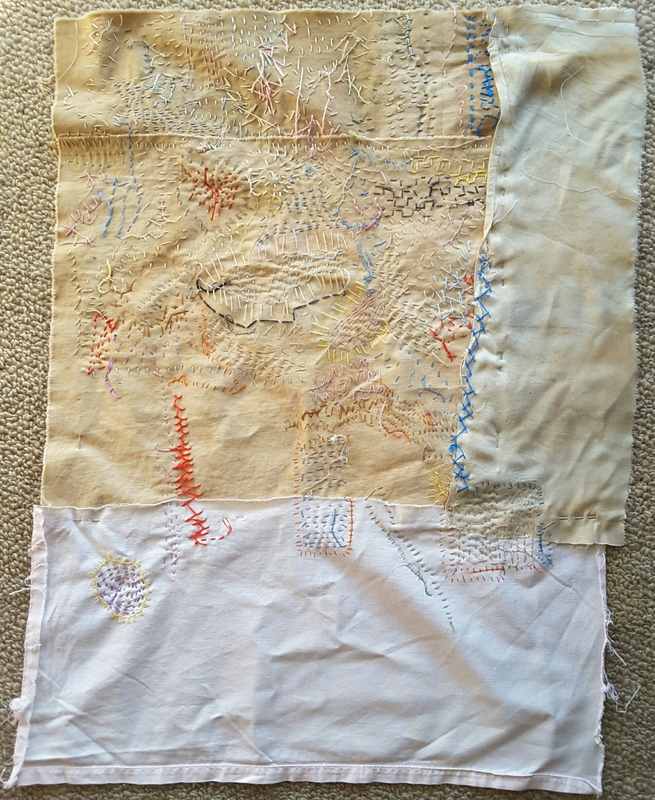 I have started this process and not looking while I stitch has helped a lot. It is so hard not to be precious with my work. The ‘back’, with two new areas of work in cretan stitch and herringbone stitch. You can see from the photo above that the reverse side of the stitches predominantly resembles small running stitches. That’s why I’m currently adding some strongly coloured lines of stitching. You can see from the following photos that the reverse of even strong colours is not very intrusive. The ongoing challenge will be to stick with the process. It may be difficult to ‘spoil’ this work, but working against an established aesthetic is hard.